The Major League Baseball Players Association (or MLBPA) is the collective bargaining representative for all current Major League Baseball players. All players, managers, coaches, and trainers who hold or have held a signed contract with a Major League club are eligible for membership in the Association. 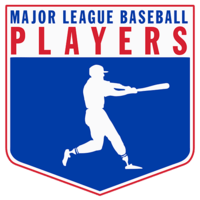 The MLBPAs Players Choice group licensing program utilizes collective marketing to assist licensees and sponsors who want to associate their brands and products with that of Major League players, teams, and coaches. Through an individual agreement with each player, the MLBPA holds exclusive right to use, license and sublicense the names, numbers, nicknames, likenesses, signatures and other personal indicia (known as publicity rights) of active Major League Baseball players who are its members for use in connection with any product, brand, service or product line when more than two players are involved. The organization that would eventually become the MLBPA was conceived in 1953. However, it was not officially recognized as a union until 1966. It is in this year that the newly recognized union hired Marvin Miller from the United Steel Workers of America to head the organization, serving as Executive Director until 1983. In 1968, Miller negotiated the first collective bargaining agreement (CBA) with the team owners, which raised the minimum salary from $6,000 to $10,000 per year. The 1970 CBA included arbitration to resolve disputes. In 1972 the major leagues saw their first player strike, in opposition to the owners' refusal to increase player pension funds. During Miller's tenure, base salaries, pension funds, licensing rights and revenues were increased. Miller challenged the reserve clause which was used by team owners to bind players to one team. The strength of the union was immeasurably increased by the creation of the modern free agent system following the Seitz decision in 1975. In 1968, the Major League Baseball Players Association negotiated the first-ever Collective Bargaining Agreement (CBA) in professional sports. The current agreement expires on Dec. 1, 2016. As of 2014, Major League Baseball is the only major professional sports league in North America that does not have a salary cap; the MLS, NHL, NBA and NFL all implement some sort of salary cap. ↑ "Frequently Asked Questions: 'When was the MLBPA created?'". Major League Baseball. Retrieved 2016-08-18. ↑ "Frequently Asked Questions: 'What does the MLBPA do?'". Major League Baseball. Retrieved 2016-08-18. ↑ "Licensing". Major League Baseball. Retrieved 2016-08-18. ↑ "About | The Players Trust". Retrieved 2016-08-18. ↑ "Players Choice Awards | The Players Trust". Retrieved 2016-08-18. ↑ Spalding, Albert G. (1911). American National Game. 1 2 "History of the Major League Baseball Players Association". mlbplayers.mlb.com. ↑ History of the MLBPA. The Major League Baseball Players Association. Retrieved 2016-10-28. ↑ "Fehr to Leave Job Held Since 1985". ESPN.com. 22 June 2009. ↑ "Frequently Asked Questions: 'When does the current CBA expire?'". Major League Baseball. Retrieved 2016-08-18. ↑ "Basic Agreement". Major League Baseball. Retrieved 2016-08-18. ↑ "MLB, MLBPA agree on domestic violence policy". Major League Baseball. Retrieved 2016-08-18. ↑ "MLB, MLBPA announce new youth initiatives". Major League Baseball. Retrieved 2016-08-18. ↑ "MLBPA/MLB joint announcement". MLBPA. 2005-11-15. Retrieved 2007-03-21.